I’m a local food blogger so here”s my obligatory Shake Shack post. I love a good burger (maybe not as much as this guy, but believe me, I’m a fan.) 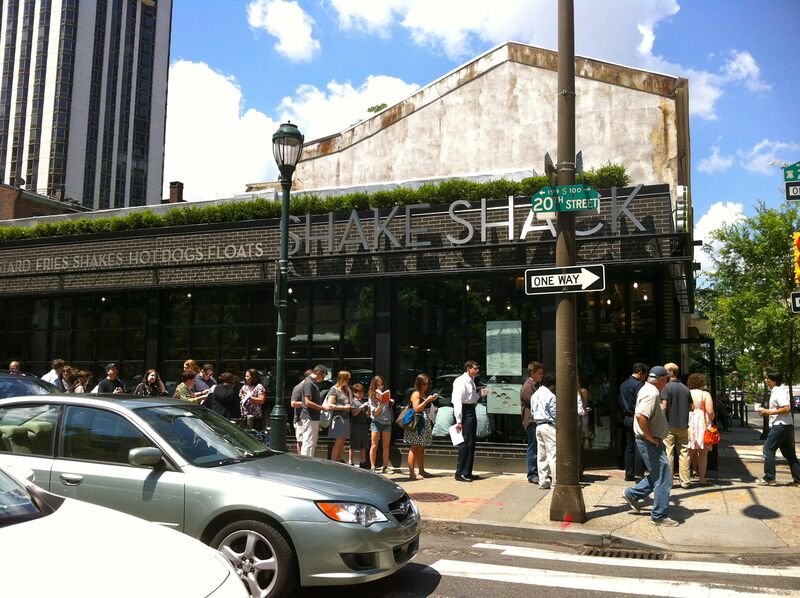 When I heard that the much lauded Shake Shack, Danny Meyer’s burger chain, was coming to Philly, I got a lil’ excited. When I heard it was coming to 20th and Sansom–walking distance from my job! !–the excitement increased monumentally. When it finally opened on June 6th, twitter told me that the first people got in line at 9:15am. No way was I waiting in line for hours for anything, let alone a simple burger. The next day, however, a few of my co-workers and I decided to brave the line (in hopes it would be shorter) and check out this new attraction. At around 11:30am, we walked the few short blocks from work and there was a line out the door and about halfway down the building. It seemed to be moving quickly, so we took our spots at the end of the line and were quickly followed by dozens of others. Our wait in line was made much more pleasurable by the friendly Shack employee handing out free custard (so rich and creamy!) and menus and asking if we had any questions. It was obvious a lot of thought has been put in to customer service. After about 10-15 minutes outside, we made out way through the door and scoped the scene. 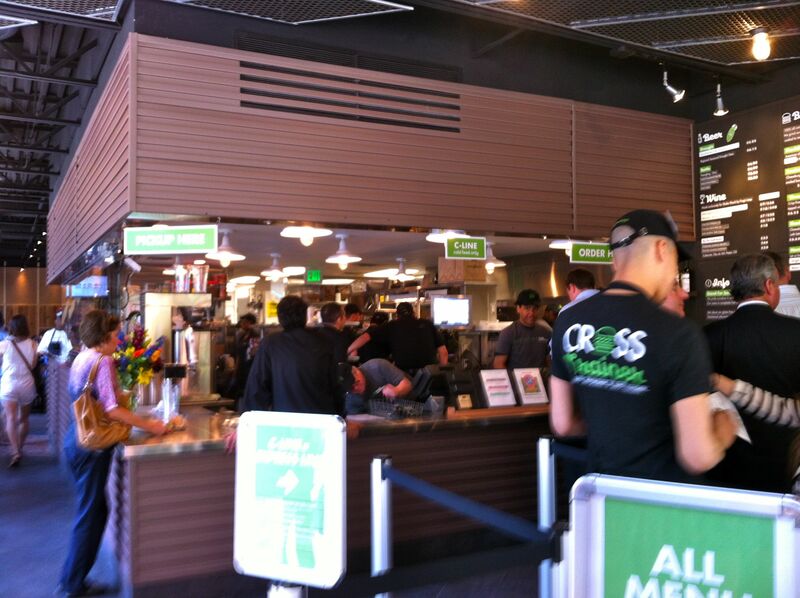 While the burger line was long, pro tip: there is a separate line for cold orders like custard, drinks, etc. So if you’re hoping to stop by for a shake, have no fear! Your wait will be significantly shorter. I put in my order for a shack burger, cheese fries and the Abita root beer on draught, which came to about $12–a bit steep for a fast food lunch. I was then given a numbered beeper that would alert me when my food was ready. As we waited, we checked out the back seating area and watched the employees at work through the glass window. My co-worker kept trying to signal to one of the employees that he had something on his nose (a spot of custard, I do believe,) but he just kept working. A highlight for me was this neat-o water fountain! But I digress…after a short wait–ten minutes, tops, my beeper went off. I was SO excited. I went to the counter to accept my food. 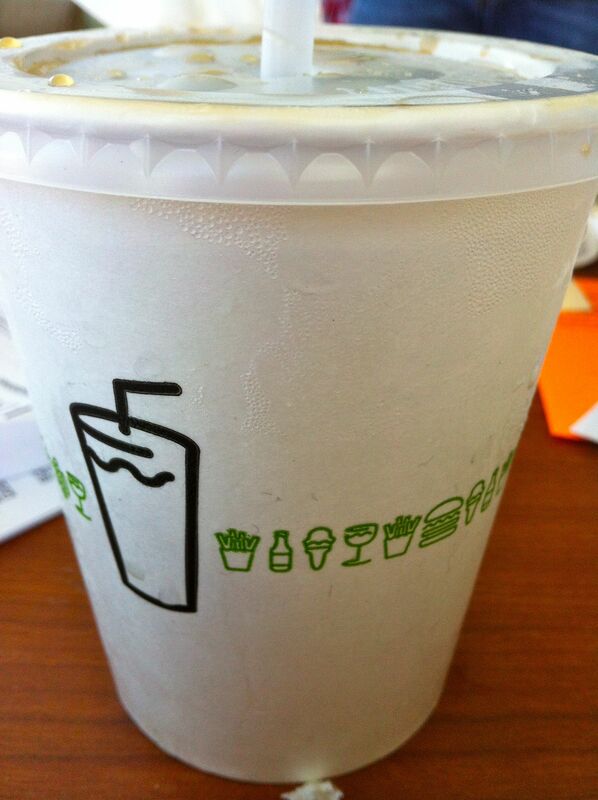 It comes in a neat Shake Shack brown bag. My only critique is that the to-go orders aren’t wrapped and our food was lukewarm once we got back to work, just a few blocks away. I bit into the burger first, of course. The Smoke Shack is a cheeseburger topped with Niman Ranch applewood smoked bacon, chopped cherry peppers and the signature Shake Sauce. I loved the potato-esque bun that contained the simple patty. The cherry peppers added a nice tang, while the bacon–well, it was bacon. What else is there to say? The creaminess of the Shake Sauce (a chipotle-esque mayo) blended perfectly with the other components contained between the bun. The burger was decent. Despite the bit of gristle I got with my first bite, it had a nice char and the entire burger, bun, condiments and all really maintained the perfect balance. While it filled me up because I had cheese fries on the side, if I only got a burger next time, I would probably get a double. I sipped my root beer along with my lunch. 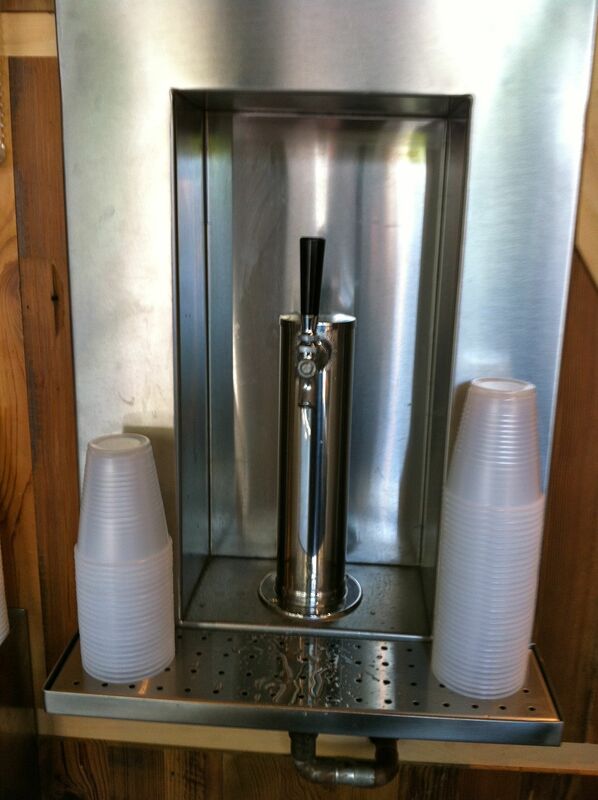 It was slightly sweeter and less carbonated than a typical soda, but certainly enjoyable. At $2.65 for a small (12 or 16 ounce) cup, it was a more than I would normally spend for a non-alcoholic drink. And I’m not even a soda drinker to begin with. 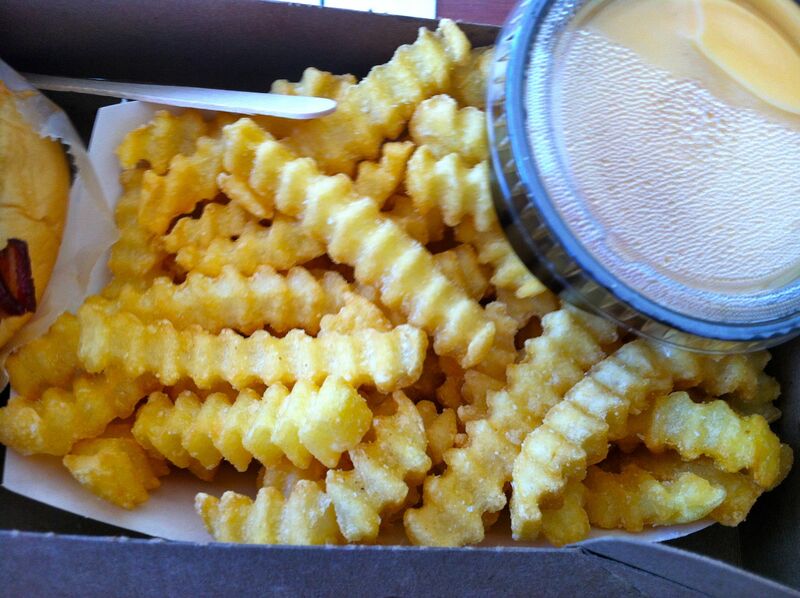 My favorite might have been the fries. 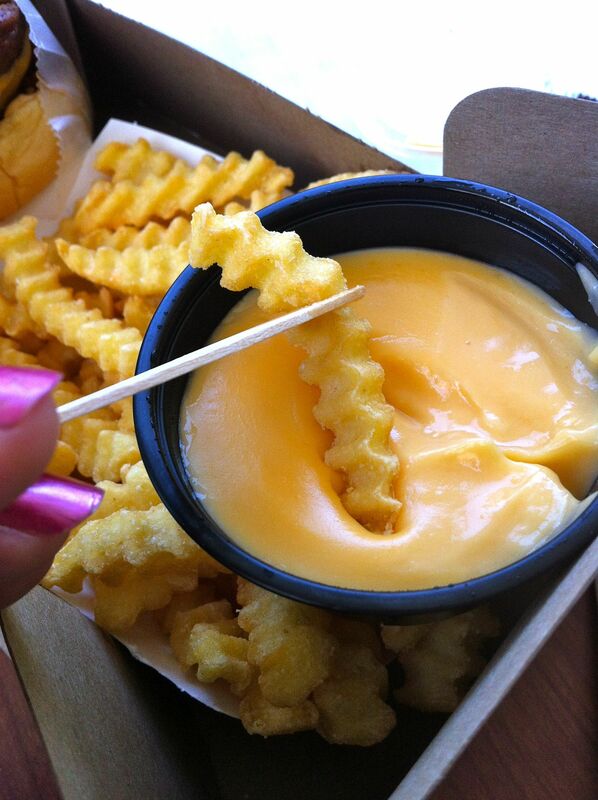 Cheese fries are high on the list (along with macaroni and cheese) of things that I *must* order when I go places. When I saw that they were crinkle-cut, I was a little bummed. Crinkle-cut is not my favorite fry “style” as they’re often pre-frozen, limp and flavorless. 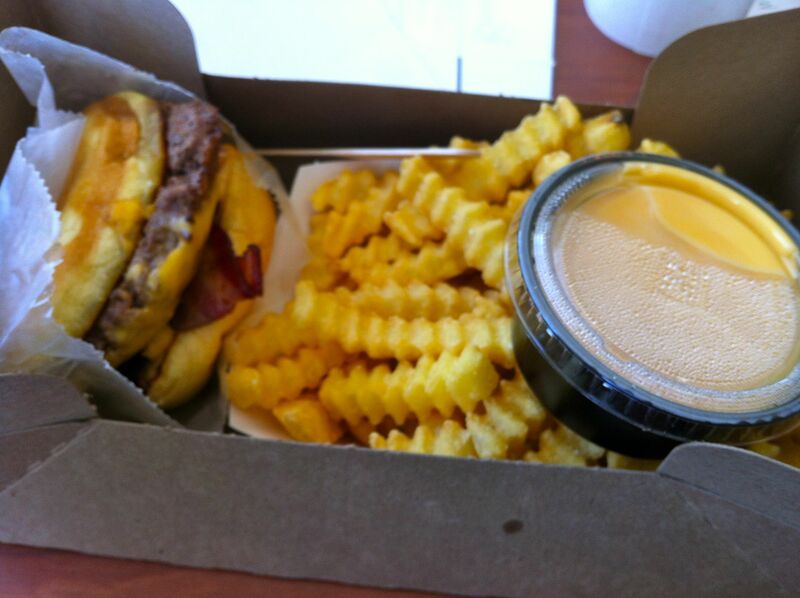 The Shake Shack proved me wrong though! These fries were crispy and extra salty (if you’re not a huge salt fan, it might be off-putting, but I loved it.) And the cheese dip on the side, a combo of cheddar and American, was nice and hearty. I hate when you pay extra for cheese fries and get a minuscule amount. Shake Shack doesn’t mess around. They also have this adorable little fork (pick? pitchfork?) thingy to help you pick up the fries and dip them in the sauce without dirtying your fingers. I tried a couple bites of the Shack-cago dog topped with a variety of veg. It was decent but with all the fine hot dog spots that we have around the city, I’d stick to burgers at Shake Shack. Bottom line, Shake Shack is a great new addition to the area. I’m surprised by the insane hype and think those who are comparing it to Village Whiskey are a little silly. But it fits its own niche and we welcome it to the neighborhood. 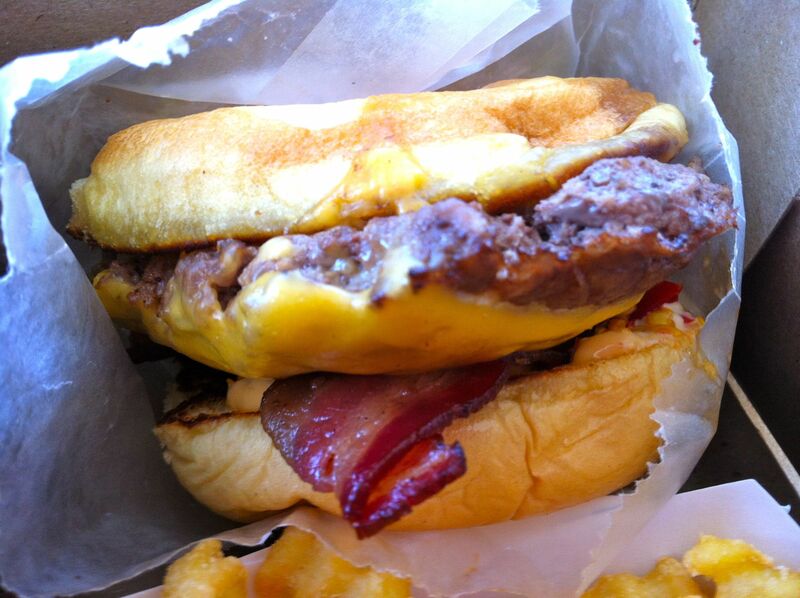 I’ve eaten at a Shake Shack in NYC, and their portobella burger is OFF THE CHAIN. I’m glad they’re in Philly, can’t wait to go back for my fried mushroom goodness!